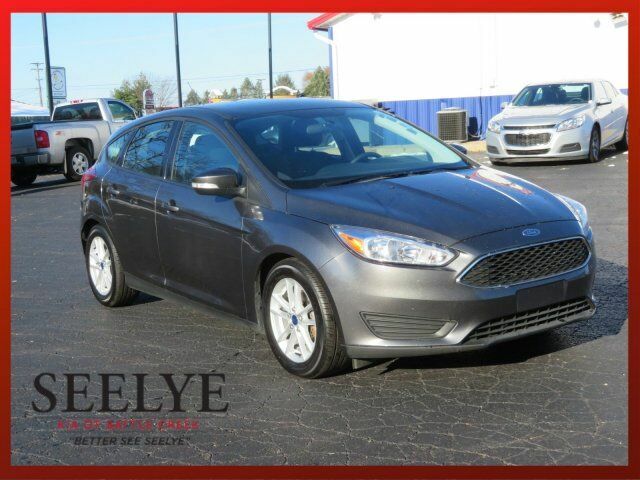 This 2016 Ford Focus SE is loaded with top-line features. Wheels: 16" Painted Aluminum Alloy, Variable Intermittent Wipers, Urethane Gear Shift Knob, Trip Computer. Transmission: 5-Speed Manual, Tires: P215/55R16, Tailgate/Rear Door Lock Included w/Power Door Locks, Systems Monitor, SYNC -inc: advanced voice recognition, 911 Assist, VHR, SYNC Services, AppLink, Bluetooth, steering wheel controls, USB port, auxiliary input jack and 4.2" multi-function display, Strut Front Suspension w/Coil Springs, Streaming Audio, Steel Spare Wheel, Smart Device Integration, Single Stainless Steel Exhaust, Side Impact Beams, Short And Long Arm Rear Suspension w/Coil Springs, Securilock Anti-Theft Ignition (pats) Engine Immobilizer, Seats w/Cloth Back Material, Rigid Cargo Cover, Remote Keyless Entry w/Integrated Key Transmitter, Illuminated Entry and Panic Button, Rear Parking Sensors, Rear Cupholder, Rear Child Safety Locks, Radio: AM/FM Single-CD/MP3-Capable -inc: 6 speakers and speed-sensitive volume control.